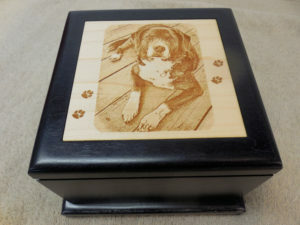 I have several designs of wooden pet urns for pets weighing about 60 lbs. or less. 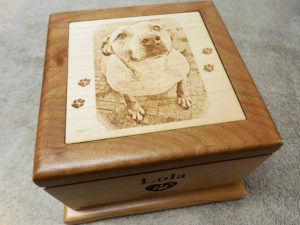 These personalized urns for a medium sized pet is made with solid Alder, Maple or Walnut wood. 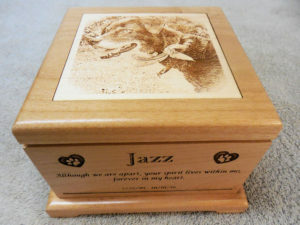 Each laser engraved urn has your photo laser etched along with your pet’s name, dates and a short sentiment. 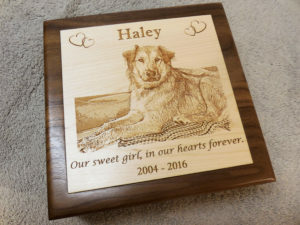 Contact me at my Etsy Store and provide me with your favorite photo of your pet, tell me what you would like to say on the urn and I’ll take care of the rest. 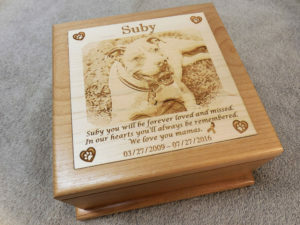 **HOW TO SIZE YOUR PET URN ** The industry standard is 1 cubic inch of space for every 1 pound that your pet weighed at the time they passed. This industry standard is an approximate size required, and is close, but not exact. 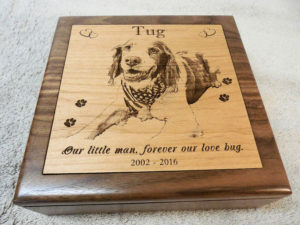 I recommend that if you plan to keep all of your pet’s cremains, and the weight is borderline for the urn size, that you purchase an urn larger in size to make sure you have enough room. 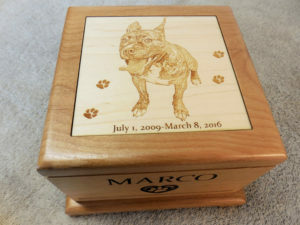 Or…Some of you may plan to spread some of the cremains in a special place that you shared with your beloved pet. In that case, the size of the urn is less critical. 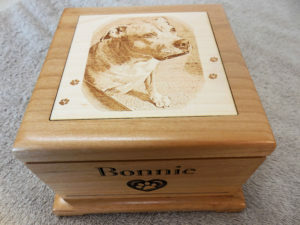 You can spread whatever amount of ashes you want at your beloved pets special place, and then place the remaining ashes in your urn. 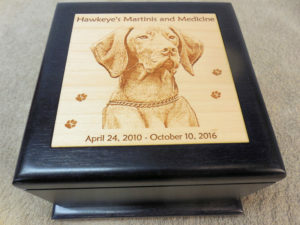 Click this link to find out more about ordering a custom laser engraved urn.